I love the look of this shower door, as it allows the beauty of my new tile surround to be the focus of the bathroom. The partial door is a clean line without the clutter of a frame and sliding door, but the size is perfect to keep the splatter contained. This was a wonderful addition to my new bath! Beautiful door for my new shower. I have gotten nothing but compliments from my installer to my contractor to all my visitors. Just the perfect finish to a great bathroom remodel. Everyone is amazed at the price and quality. I want to thank Overstock again for just the product I was looking for even when I didn’t know for sure what I wanted!! 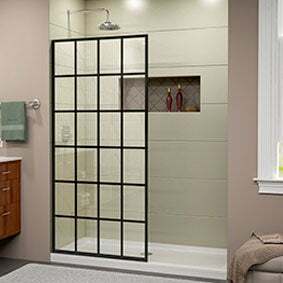 Choose DreamLine for the largest selection of off-the-shelf shower doors, shower enclosures, tub doors, and other shower related products. DreamLine shower doors and enclosures deliver superior quality, innovative designs, and sophisticated style at an incredible value. 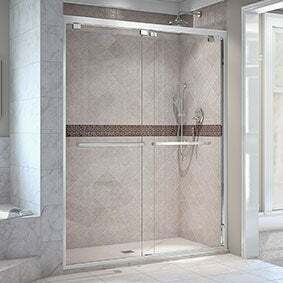 DreamLine shower doors are engineered to the highest possible standards in craftsmanship and materials, from premium thick tempered glass to the finest quality hardware. DreamLine complete shower installation kits combine the high-quality design of a DreamLine acrylic shower base with its shower wall system. DreamLine’s variety of tub doors offer high-quality and sleek, modern designs. Find your perfect tub door here. 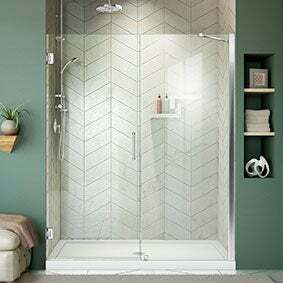 DreamLine shower bases (also called shower receptors, shower trays or shower floors) may be combined with a DreamLine shower door or shower enclosure.